Good – easily adjust shelving height, swap out storage units or add on storage units and shelving MINIMAL – Unless your designer has designed a modular system for you, the adjustments you can make are minimal like adding or removing shelves or adjusting shelf height. AVERAGE – Some poles may be quite thick and take up space. Items may easily fall off open shelving due to the lack of back or side panels, so you can’t pack too many items on an open shelf. GOOD – Customize storage of clothing, bags, cosmetics and accessories to the finest detail. Most folks don’t change their wardrobe configuration often. However, if you foresee a lifestyle change or change in ownership of the wardrobe, this might work well for you. If you have specific storage requirements and would like to optimise space, this will probably work better for you. Engineered wood product made of thin wood layers. Wood layers are glued together to form a solid piece. Engineered wood composite made of wood fibres. Engineered wood composite made of wood chips. GOOD - Less susceptible to water damage. AVERAGE - Susceptible to water damage. POOR - Very susceptible to water damage. GOOD - Very strong. AVERAGE POOR - Low strength. Most costly. Cheaper than plywood but more expensive than particle board. Low cost. Although most costly, we recommend plywood for its superior properties. i. Consider using the AA system (a.k.a. AA tracks) to easily adjust the shelf height. This is especially useful for storing bags, cosmetics and smaller items. ii. Upgrade hinges and drawers tracks for better performance and durability. Generally better for accessing/ viewing more sections of the wardrobe, especially for wardrobes with shorter lengths. Can be made into a retractable door to maximise flexibility. Good for small spaces and narrow walkways – no need to step back to open the wardrobe door. Less commonly used but useful for maximum accessibility to small wardrobe sections. No hassle of doors so you view your whole wardrobe at one go. Great if you intend to keep it neat display your clothing. Generally durable. Use good sliding hardware and keep the tracks free of dirt to ensure smooth operation. Use good hardware and keep the tracks free of dirt to ensure smooth operation. Gets dusty and more likely to deteriorate in a humid environment. 5. Walk-in Wardrobes – do you have space for it? 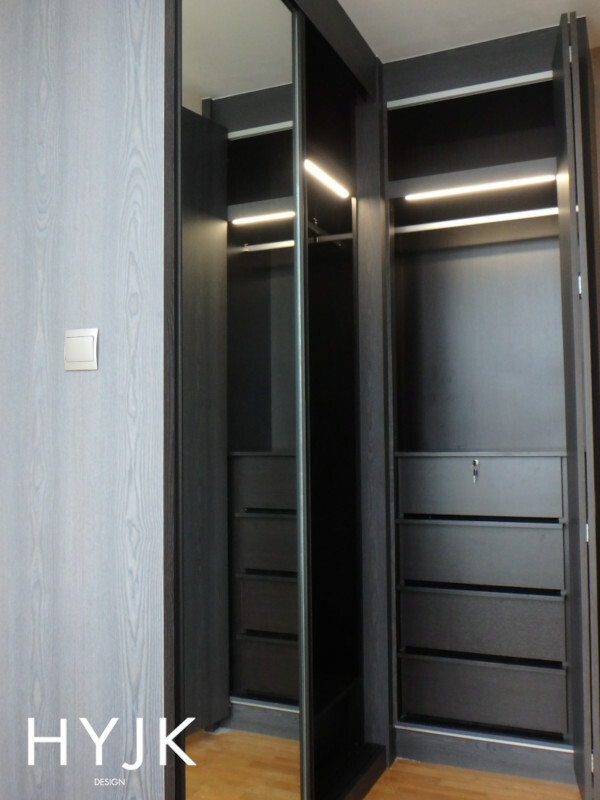 Walk-in wardrobes require a minimum space of 1.2 m by 1.2 m (L-shaped). If you’d like to have an island in the middle, you would require a minimum width of 3 m to do so. The minimum walkway clearance should be 60 cm. These dimensions are the bare minimum though. To be sure, mark out the space on the floor with tape and see if you are comfortable with the space allocated for the walk-in wardrobe. Keep these in mind when planning for storage! How much space do you need respectively? Any odd shaped or bulky items? For example, if you do sports, you may need to fit some odd shaped gear into the wardrobe. If you travel, you may want to store luggage bags in the wardrobe as well. Do you foresee major lifestyle changes in the future that will affect your wardrobe? If so, you would need to keep the wardrobe versatile to make way for these changes. That’s a lot to digest.. so where to start? 1. Identify items you’d like to have in the wardrobe (safe, accessories, dresser, luggage bags, etc.). 2. Take photos of your existing wardrobe. 3. Decide on a budget and engage a designer to plan it out for you! Want to leave the planning to the professionals to build your dream wardrobe? Make an appointment with us for a complimentary on-site consultation. Click here to make an appointment.